Human Influence would like to present our new history of science series through what we call Universe in Reverse. With each installment, we unearth and catch a glance of a worthy, subversive scientific pioneer. 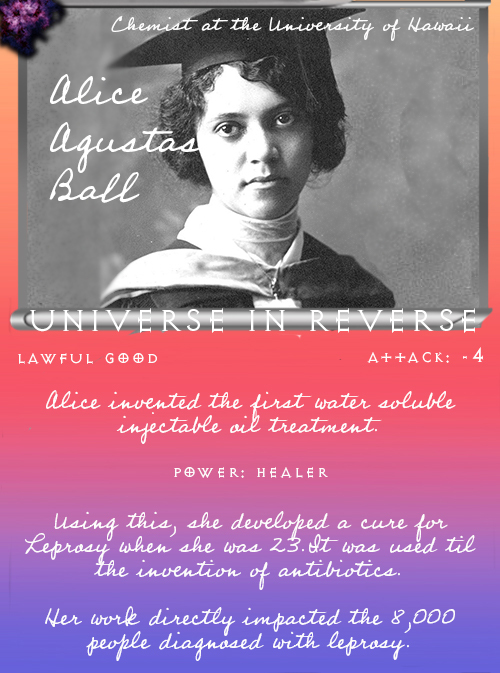 Alice Augusta Ball (1892-1916) exemplifies the best aspect of a scientist looking to make the world a better place. Her family moved to Honolulu in hope to improve her grandfather's health. His health didn't last and he died in 1902. I imagine this moment shaped Ball and all her efforts in her later work to alleviate pain of leprosy. Ball earned degrees in both pharmaceutical chemistry and pharmacy from the University of Washington, then pursued graduate studies at the University of Hawaii and continue working on her thesis The Chemical Constituents of Piper Methysticum [kava plant]. It seems she never got the chance to finish that paper because we cannot find it. For this effort and her investigations into the chaulmoogra tree, in 1915, she became the first black woman awarded a master's degree in chemistry from the University of Hawaii. Ball's key contribution to science was the discovery of a usable and easy method of using the oil of the chaulmoogra tree. This plant, native to India, had use in skin creams and injections as a treatment for leprosy; unfortunately for patients, it had the side-effect of being very painful. Ball created the process by which the beneficial chemicals could be extracted from the chaulmoogra tree, thereby increasing patient comfort and decreasing overall length of treatment. Thanks to Ball, people no longer had to be exiled to leper colonies (one of the largest of which was located in an isolated corner of the Hawaiian island of Molokai). Her findings went up for grabs after her death in 1916. Arthur L. Dean, president of the University of Hawaii continued her work, cut her out of the credit, and renamed Ball's method for processing chaulmoogra oil after himself. A plagiarizing move like this could have buried Alice Ball in the sands of time; however, someone stood up. Harry T. Hollmann, the researcher who originally suggested that Ball study the chaulmoogra tree, advocated and cemented Ball's legacy as the inventor of the treatment for leprosy before the invention of modern drugs. Wanda Lough: Autodidactic. Reads a lot. New to Austin area. From New Jersey and Arizona. No college degree. Art enthusiast and a professional admirer. Favorite album of 2016 was Wildflower.